Tossing something that can be fixed seems a terrible waste to this old fuddy duddy. A few weeks ago, the really nice Philips powered subwoofer and satellites I use with my computer went bad. I’d had the system for around 15 years, and loved it. The audio is incredible. It still played, but it hummed terribly and the sound was distorted whenever it was turned on. 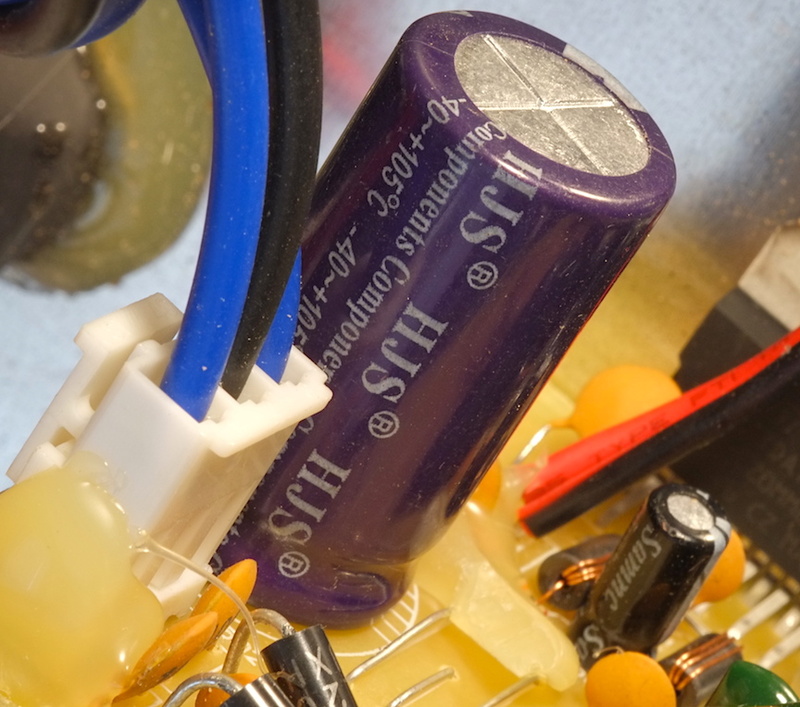 It had a failed electrolytic in the power supply. I ordered a replacement for $1.69. Two actually. I discovered I could get two for less than buying just one, and now I have a spare. 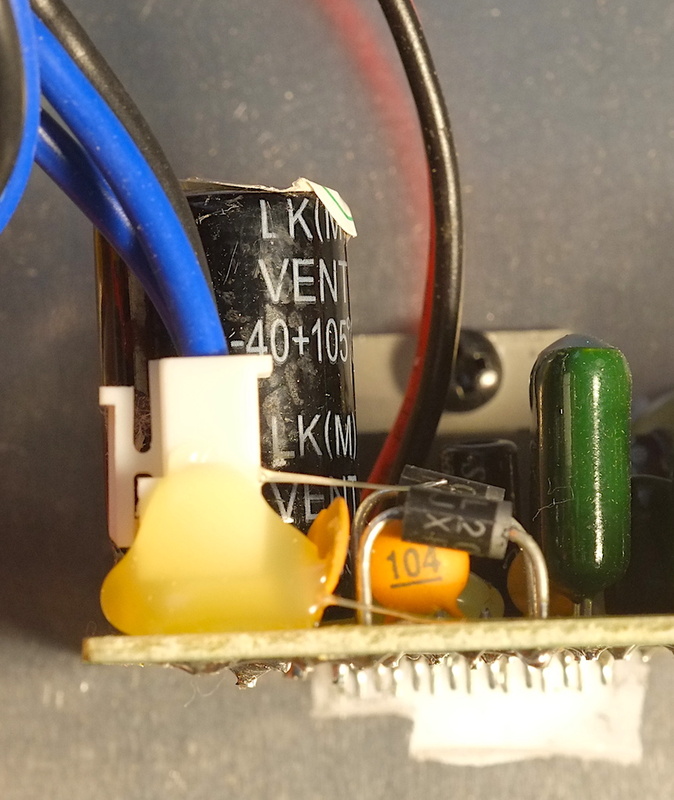 The hardest bit was freeing the failed part from the hot-melt glue that was dribbled all over the place to keep connectors and some of the larger components from vibrating loose or rattling. Unfortunately, it also made it difficult to remove this component without damaging others. But I got lucky, got it out without damaging anything else and a new one in - and it worked. Back to sounding like new. Other repair jobs to report to inspire others to repair not toss? How about make and mend allows you to spend more on what you really want to spend it on? I'm all about repairing the old or making my own, but I wasn't always so respectful. Now it's a mission to make my own parts or repair my own stuff any time I'm capable. Good clean fun. I had a 50 something inch TV that I used for several years. I pulled it out of someone's trash and spent $1.50 on a capacitor to fix it. I had to say goodbye to it after the move to Ohio though. It went on the truck working and came off broken. I couldn't find a smoking gun causing the issue and wasn't willing to shotgun entire boards at it. My wife's laptop charger lost a prong when the cats ran across the cord and ripped it put of the wall. I did an emergency fix that was only meant to last till she ordered a new one. That was eight months ago and it's still going strong. I safety wired a rattling shroud on her trucks exhaust almost five years ago to avoid buying the steel band clamp. Still holding! Rather than buying a whole new main sheet block for my sailboat, I fixed the old one. Yeah, it took three trips to Lowe's to get everything, but it works great. I can make just about anything go just a little bit further. Some of my eldest corn cob pipes have been examples of this. I seem to repair more toilets than anything else these days. Often, the hardest part of fixing a thing is figuring out what's broken. Too many people don't know enough about how machines work to logically troubleshoot the problem. With respect to dp's repair, figuring what to replace was 80% of the job. Hell, a 12 year old girl in China probably built the thing so the physical repair - desoldering and soldering - is easy enough. I often tell people that my job is basically drawing lines and circles. Anybody can learn it in a few weeks. But knowing what lines and circles to draw, that's the trick. Often, the hardest part of fixing a thing is figuring out what's broken. Any of you Old F'er Geezers wanna come look at my dishwarsher? YouTube helps when your dishwasher leaves? I dont know. Mine hasnt left. But yes, YouTube helps me trouble shoot repairs for household appliances. Youtube for instructions, Mar-Beck (95th & Nall) for parts. I'm still waiting for a timer for my dishwasher. Its been on backorder since November. I'm not really sure it will solve the issue, even. The detergent container doesn't open, and I've already replaced the container assembly. Trailer turn signal for truck. Inside door handle on my trucks drivers side door. Just to name a few ... 2018 was a heck of a year. I hope to catch up in 2019.